Long time lurker, first time poster here. 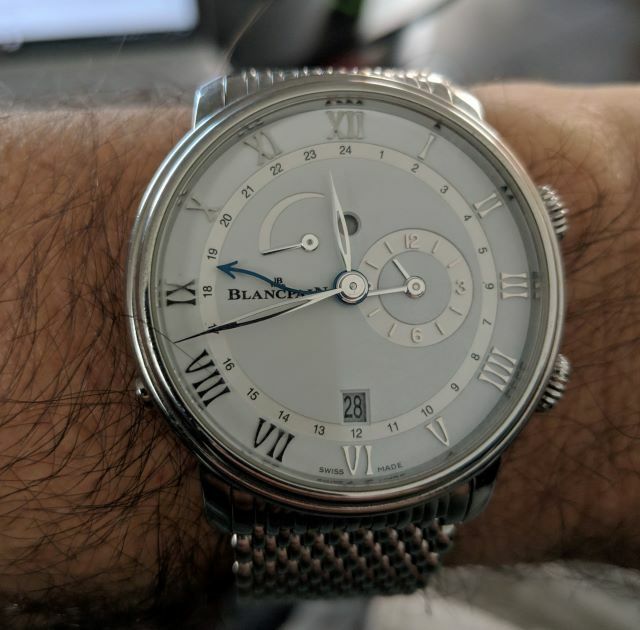 I have been a watch collector and a Blancpain fan for a number of years. Bought a Leman 2185 Chronograph about 10 years ago and wore it as my daily watch for many of those years. It is currently out for service. I recently picked up a Villeret GMT Reveil in steel at an AD. It is on the Maille bracelet. I really think this is a great looking classic timepiece. The size is perfect and the GMT and alarm functionality are really useful for traveling. The alarm is actually loud enough to actually wake me up! The quality of the watch is typically Blancpain which is excellent. The bracelet is the most comfortable metal bracelet I have ever worn from any brand. My watch has a low 3 digit serial number (close to 100) and I get the feeling the watch had been sitting at the ADs for quite a while. The online visibility of this watch is really low. I have seen videos of the Leman Reveil but very very little about the Villeret Reveil. The watch is on the Blancpain website so I know its still in production. I've never seen an owners report, review, etc. There is a youtube video of someone demonstrating the alarm sound but that's about it. Even the blancpain blog has nothing on this watch. 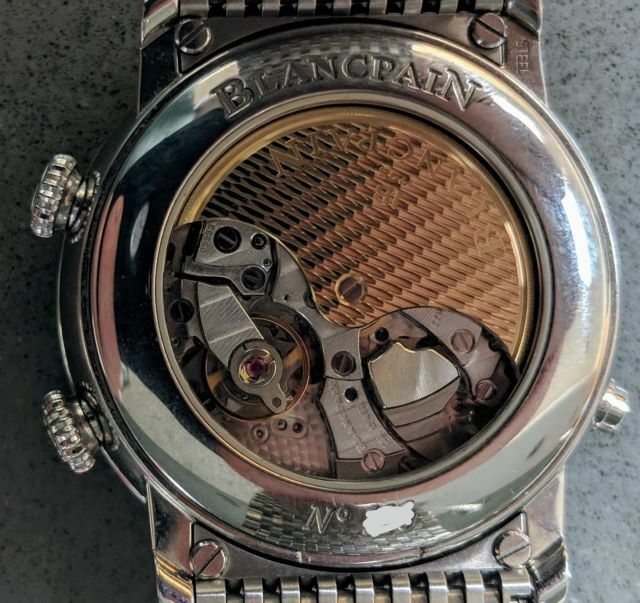 Anyone have any more information about this watch and why it seems to fly under the radar? Are the production numbers just really really low? It's a lovely timepiece you got, especially on the Mille Mailles bracelet which is as difficult to assemble as for instance a Royal Oak bracelet due to its subtle tapering. I will try to get my hands on one in the near future and do an extensive photo session, the outcome will of course be posted here. Generally the Villeret line has been covered less than the Fifty Fathoms models, but with the now streamlined collections visible on the website (Fifty Fathoms, Villeret and Women) this may change moving forward, it would be well deserved. For Blancpain the Villeret line is still the largest segment, the focus in North America and Europe however sits more with the Fifty Fathoms line. By the way: I edited your post slightly since we do not want to discuss net prices paid or the grey market as per Timezone guidelines. I hope to see more of your Villeret GMT Reveil and also your 2185, and I also hope you enjoy the TZ Blancpain forum! I am new to Blancpain & my question may seem silly but why are nearly all the watches in the Villeret family with the exception of a few gold pieces white dial? Is their a historical reason? "Do Not Squander Time. That Is The Stuff Life Is Made Of." - Gone With The Wind. The first segment includes watches in steel, rose gold, white gold and platinum with up to 40mm case size and applied roman numerals. In this segment the steel versions have mostly white dials, sometimes grey dials. The second segment has 42-45mm cases in precious metals only with Grand Feu enamel dials. The third segment are the Grandes Complications, the former Le Brassus line. White dials have a tradition going back to 1982 when Blancpain introduced its first modern pieces, in fact those all had plain white dials. In the 1990 white dials became linked to steel Villeret pieces, because the precious metals watches received opaline, blue, black and brown dials. As stated above, the white dial with applied roman numerals today stands for the steel case in the Villeret line. But those are in the minority since most Villeret references are made in precious metals. You have got a real beauty there; an excellent combination of form and function! I'm more of a lurker myself these days but still enjoy this community-maybe you could give us a long term report down the road? Very Informative Thank You Again! Beautiful, congrats! The prefect travel watch if you ask me -- there aren't too many GMT + alarm options out there (especially under 14mm thick). Thanks everyone! Still totally grooving on this watch. Blancpain really created a beautiful, functional and compact piece of horology. My only wish is that this watch had lume. I know its a dress watch so its not really appropriate, but when I travel, I tend to prop my watches on the nightstand to use as a clock. What's the resolution of the alarm, is it set to the closest 5 minutes? five minutes seems about right from my usage. Just saw your photoshoot of the Villeret GMT. Beautiful photography. The dial on the gold version is quite spectacular. Love the guilloche! Do you know if the guilloche is done with a rose lathe like Breguet? Also, saw your reference to a "secure movement". I have not heard that term before. What does that mean? I particular appreciated that you included pictures of the Leman GMT. The Leman dial has a bit too much going on for me and it is interesting how different two watches with the same functionality can be. The Villeret manages the same function with a much more simplified dial and only the loss of the second hand. I think you are right that the movement has found the right home in the Villeret. Beautiful photos, the dial on the RG is stunning! Would have loved a similar guilloche dial in white metal like the Quantième Annuel/GMT(6670-1542-55B). Nonetheless, as a travel watch I'd personally opt for the understated SS variant. ... I need to point out that the rose gold dial is a so called Flinque dia, that means it is it is embossed and not cut like a Breguet guilloche dial. 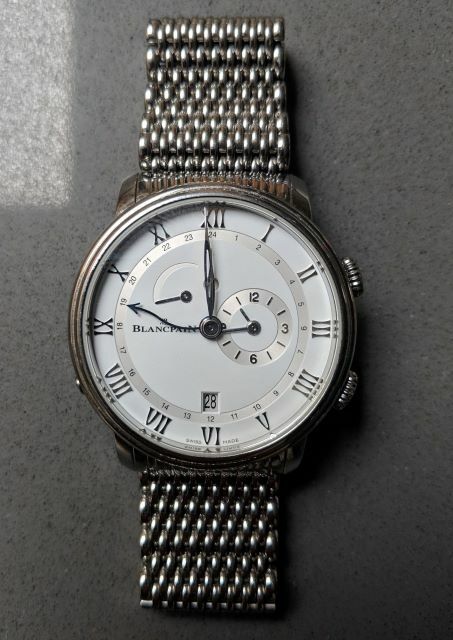 The secure movement is something Blancpain put quite some effort in, it means that the calendar mechanism cannot be damaged when operating the under lug correctors during the time the calendar changes to the next day. Thanks for the clarification regarding the Flinque dial. Having held and handled both the SS and RG in the metal, I'm curious if you have a personal favorite? ... but as a traveling watch working in both formal and casual environments, I would probably prefer the stainless steel version.